Don't you just hate it when you're unable to enjoy a gloriously sunny autumn afternoon because you're sick in bed with a fluey bug and a fever? There I was last Thursday: lying on my bed in my pajamas, listlessly trying to watch a DVD playing on my laptop but unable to concentrate on the shenanigans taking place at Sterling Cooper Draper Pryce... when I became aware of a faint jingly-jangly music coming from my open window. I hit pause on the DVD and squinted my ears, and gradually realised that the jingle-jangle was a sped-up recording of 'Greensleeves' and was getting louder, which could only mean one thing: an ice cream van was about to drive past my bedroom window. Remarkably, it proceeded to park a mere twenty metres from my doorstep. "IT'S A SIGN! ", my febrile mind deduced, and without another thought I grabbed some coins, thongs and my phone, aimed myself at the front door and lurched through it. After the children in front of me had bought their ice creams, I stepped up and asked for a cone dipped in chocolate and nuts. The ice cream man cast his eyes down at my pajama pants and raised his eyebrows. When I explained that I was home from work sick, he not only wished me a speedy recovery but also added a flake to my ice cream cone FOR FREE. That's a great story. I really enjoyed reading it. Hopefully the ice cream cheered you up and assisted your recovery! 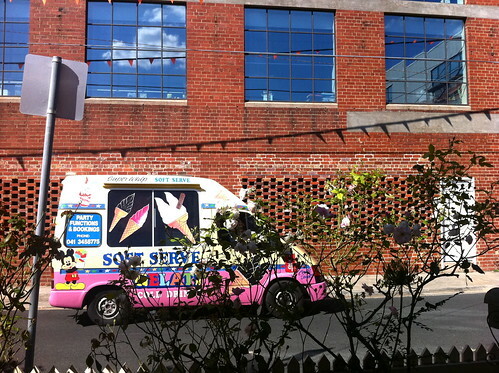 I'm home sick and fevery today - wish I had an ice-cream truck visit! Total win! Nice. 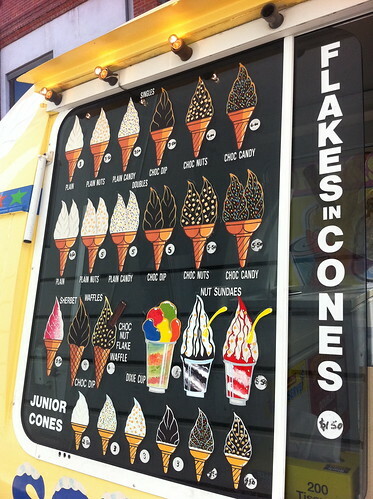 I alwsy have a cone first then get cravings for a flake but thats just me. Ah brilliant! And look at his flourish of the ice-cream and grin - priceless! I hope no one from work saw you! 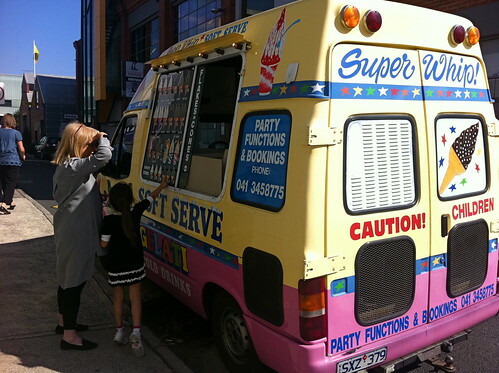 Oh, ice cream trucks are so nostalgic! 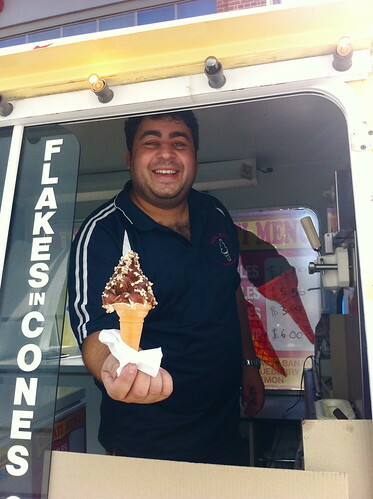 How lovely of the ice cream man and I hope you are feeling much better! How good is season 4 of Mad Men! I'm only about half way through and loving it. Also very ill myself so am not sure what will keep me compnay when I finish the season. Perhaps Boardwalk Empire? what better way to cure a sickie! hope you're feeling better, though i can't imagine that experience made you feel anything but awesome. Thanks to all who left comments about this post! I almost didn't include it on blog because I thought it was silly and outside MG's usual ambit, so I'm glad you enjoyed it. Sarah: Fear not, it was an entirely legitimate day of sick leave, with a doctor's certificate to prove it. Nola: Yes I loved season 4 of Mad Men, especially 'The Suitcase'. I enjoyed Boardwark Empire too, but I'm a sucker for anything set in the 1920s. The standout character in BE for me is Richard Harrow - have you come across him yet?